An elite team of DNR River Doctors paid a visit to the Scuppernong River to see how their patient was doing. Over the last 20 years, since DNR veterans Sue Beyler, Randy Schumacher and Ron Kurowski initiated the “healing” of the river in conjunction with the Scuppernong River Habitat Area restoration project, the health of the Scuppernong River has steadily improved. Nevertheless, the River Doctors advised that more “trout stream therapy” is in order. Let’s meet the doctors. 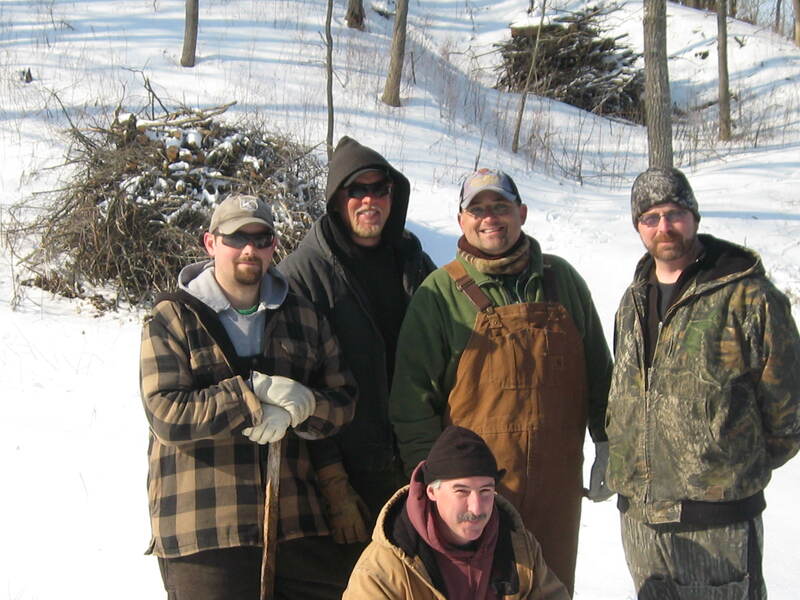 From left to right starting in the back row we have Josh Krall, Andrew Notbohm, Steve “Gus” Gospodarek, Ben “Benny” Heussner and in the front row, trail boss Don “Double D” Dane. Check out the DNR contact site for more information. You can review their most recent work on the Scuppernong river at the end of this Interview With Ben Heussner. By the way, on the first leg of our recent Journey Down the Scuppernong River, I expressed disappointment that water from the river had spilled over into the channel, which they had endeavored to segregate from the river last summer. Ben and Steve explained this was to be expected for 3 reasons: this is a flood plain and it is perfectly natural for the river to overflow its banks, there are water sources to the North of the channel that still feed it, and finally, they would have had to excavate the old river bed to an unacceptable depth, basically turning into another canal, to enable it carry more water. “Time heals all wounds” as Gos said, and the area in question will take many more years to completely heal. I was joined by Pati Holman and we couldn’t have been more excited as we left the parking lot to survey the river to see what treatments the doctors might have in mind. We identified 6 “projects”, or areas, where some therapy could be considered. The blue numbers on the map below will be referenced as we travel upstream from the marl pit bridge to the headwaters at the Scuppernong Spring. Our first stop, project #1, was downstream a few yards from the marl pit bridge where the river splits in two forming an elbow that rejoins the main stream 30-40 yards downstream. I asked them to consider if we should close this side channel, which I made an ineffectual attempt to do last summer before Tracy Hames came to visit. Then we proceeded upstream to the next bridge over the river where the water flow gauge was recently installed, where Steve explained what state the river was in when they began the “trout stream therapy” in that stretch. We followed the right bank upstream maybe 100 yards to the site of project #2. You can hear Steve and Ben discussing whether or not it was a good idea to remove the boards that we see in different areas of the river bed. They ultimately recommended that boards in the middle of the channel, where the water is moving the most freely, be removed, but boards on the periphery could be left in place so as not to disturb the muck. Then we continued upstream another 100 yards or so to project site #3. You can probably tell from my excited chatter that I’m having a really good time. Then we continued upstream to the site of the dam that formed the upper, larger, of the two Ponds of the Scuppernong. Then with perhaps the key insight of the morning, Dr. Heussner identified that the river was suffering from a gradient problem and that an elevation study was required (project #4). Take a listen. As we progressed upstream, we considered that any further efforts would have to be done in sympathy with the establishment of the proper grade as Ben described above. We next arrived at the Emerald Spring where we discussed the idea of dredging the muck from the river to prevent it from going down stream once the improvements in the grade are achieved. This would be project #6. Finally, we made our way over to the outflow channel from the Indian Spring, where Don had suggested some bio-logs might be useful. The doctors weigh in on project #6. As Ben mentioned above, they will need to “chew on it” for a while to determine which of these projects they want to proceed with first. Depending on the needs of the project, we may try to enlist the South East Wisconsin Trout Unlimited group to give us a hand. Pati and I had a great time hanging out with the DNR Fisheries team and “Double D” and we learned a lot! I hope you did too. 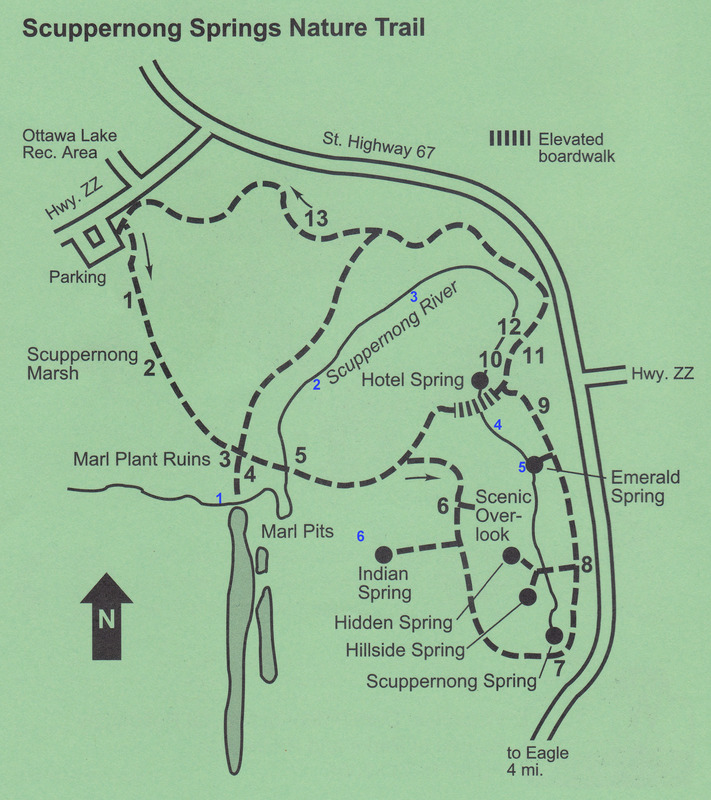 This entry was posted in Indian Springs, Scuppernong River, Scuppernong Springs and tagged Indian Springs, Kettle Moraine State Forest, Kettle Moraine Trails, Nature, Scuppernong River, Scuppernong Springs, SouthEastern Wisconsin Hiking Trails by paulmozina. Bookmark the permalink.